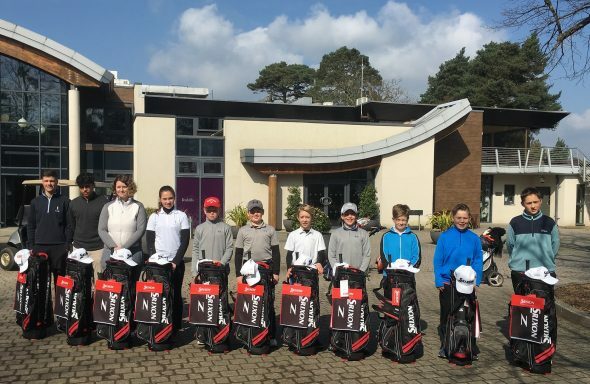 Young golf talents showed they were made of stern stuff as they came through the Beast from the East to claim a coveted place on the Foxhills Foundation. Some of Surrey’s brightest young talents were handed a potentially life-changing opportunity to earn themselves a scholarship in an open trial day at the historic venue and follow in the footsteps of European Tour stars Paul Casey and Anthony Wall, who both graduated from the scheme on their way to golfing stardom. So far, the Foxhills Foundation has helped develop almost 300 golfers since it started in 1986. Despite persistent blizzard-like conditions, more than 30 keen youngsters aged 11-18 were put through their paces with a series of skills tests and observations with 14 now selected to join the various age groups. With former Ryder Cup star David Howell in attendance to pass on some motivational words and advice, the group shrugged off the snow and freezing weather conditions as they showcased their potential. The successful candidates have now been given free membership at Foxhills with its two stunning Championship courses, a par-three nine-hole course and exceptional practice facilities. They will also receive regular specialist tuition from the county and national-level coaches at Foxhills and generous support from the Foundation’s official equipment partner Srixon/Cleveland Golf, which will now give them the very best chance of realising their potential. Abbi Rowlands, Alex Jakins, Rhys Williams and Zain Ahmed were selected for the advanced squad, Cody Fernandes, Fletcher Rees, Guy Allen, James Brash, Joseph Gould and Sean Barnfather joined the intermediate squad, while Evan Taylor, Louis Rees, Maddyson Beeching and Sam Cox earned their places on the development squad. Foxhills director of golf, Chris Fitt, said: “The weather wasn’t ideal but we’ve seen some real potential and it’s genuinely exciting to think we could have seen a few future champions taking their first steps towards an elite career. If the new scholars needed any extra motivation, they can draw inspiration from Aadam Syed, who has just earned a place at Midland College, Texas after cutting his teeth in the Foundation ranks over the past seven years. Syed has earned a 70 per cent scholarship and will attend the same college which produced Ryder Cup players Andrew Coltart and Chad Campbell. The 17-year-old is clearly one to watch for the future and has been making impressive strides in junior and county golf, while he also made the top-16 in British Boys Amateur Championship at Nairn last year. He also tasted double success last summer, lifting the 2017 Surrey County under-18 championships with a four-under-par total and the Foxhills Junior Open after firing a six-under-par winning score. He has also represented the county and was ranked in the top-16 in British Boys.